I don't care how many velvet dresses and grunge-inspired outfits are on the streets right now...the 90's are over and so is real estate cold calling. If you’re still trying to generate your leads like it’s 1995, it’s time to rip that page out of the sales playbook. Old-school tactics like cold calling have seen their day, and a lot of their effectiveness has waned. But is the strategy dead? Not to some, but it is to me. Not only do I believe that real estate cold calling is dead, but I am confident that those of you that refuse to adapt to the modern ways of marketing and doing business will find your careers to be equally lifeless soon. You know as well as I do that every expired listing and FSBO is getting cold calls from dozens of other local agents and are more than a little resistant to listening to you recite the same scripts that they have already heard. The secret to being successful in real estate is no longer directly tied to your ability to smile and dial. Now the name of the game is standing out from the crowd and creating relationships that foster trust and true believers out of your prospects. So today I want you to put down the phone and try these tactics instead. Hands down, people spend the majority of their time on social media — whether it be Facebook, Twitter, or Instagram. These channels are windows into who your leads are, what they’re interested in, and even what they’re complaining about. This gives you an unfiltered view into what they need, and an easy opportunity to place yourself at the front of their consideration. With a quick message or response, you can easily spark a conversation that turns into a $300k home deal. Of course social media requires a certain amount of diligence and a commitment of your time, but how much time are you spending cold calling? Better yet...how much money are you spending on cold calling (lists, dialers, etc.)? Social media is FREE and when done correctly, will inspire your ideal clients to come to you when they want to buy or sell, rather than requiring you to chase them down. You can create true believers out of your social media following by regularly putting out appealing real estate content that tells the story of your brand, offers value that solves their problems, and positions you as a trust-worthy expert. Real estate cold calling is a waste of time. Personalized messages are king when it comes to selling. Keep in mind, the home buyer (or seller) already has a ton of information at their disposal. They don’t need to be sold on what they want — they already know what they want! They want to know that you’re going to provide personalized service for them. Hence, smart prospecting. 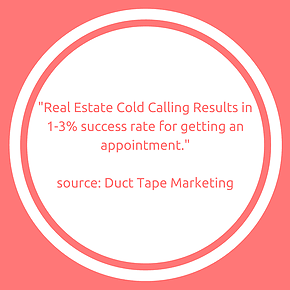 There are several ways that you can start prospecting smarter, rather than harder, and quit real estate cold calling for good. 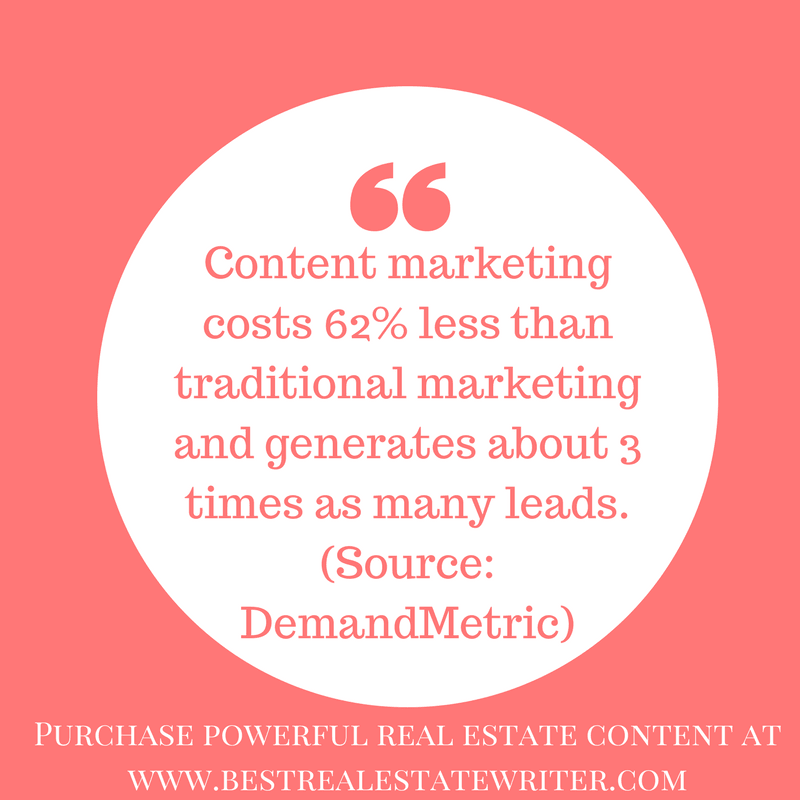 In order to be effective at smart prospecting with your real estate content and digital marketing, you need a lucrative real estate niche that you can focus your content around. If you post statements like "Let's talk real estate" on your social media trying to entice prospects to reach out to you, you will disappointed with the results. Rather than putting out a generalized statements like that, why not "talk real estate" through blog posts and LinkedIn articles that are specifically designed to solve your prospects' problems? Start the conversation with your custom real estate content and give them the opportunity to keep the conversation going through comments. Always, always, always respond to comments (positive or negative) with more information and a question to keep them talking. Additionally, if you take a few minutes to get to know each of those that reacted to or engage with your content, you will have a greater chance of saying "the right thing" to hook them. Browse through their social media profiles and website and take notes about what their needs are so that your feedback offers relevant solutions. 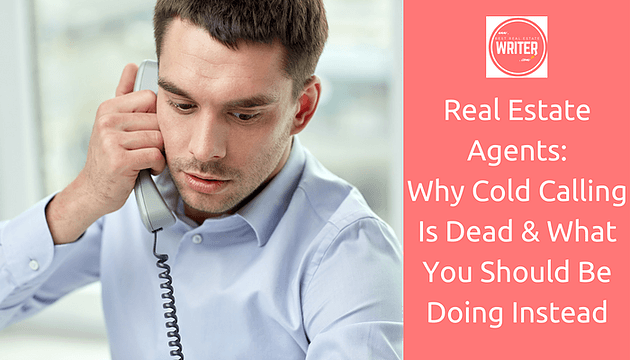 I know I am not the first person to tell you that real estate cold calling is "dead". I won't be the last either. I'm curious though - are you still going to continue real estate cold calling despite all of the rejections, foreboding statistics, and warnings from marketing experts? I am not telling you that outdated tactics like cold calling or direct mail don't work or have never worked. What I am saying is that they are not the best methods in terms of your return on investment. In other words, if you spend $500 on cold calling (lists, dialers, etc.) and I spend $500 on content marketing, you will yield X in return and I will yield 10X. I don't know about you but I would rather have 10 times the returns for my investment of time and money.